For my friends who follow my blog and who know me at all, you know that my passion is all about hearing the voice of the Lord. WHY is it a passion? Because He broke through my darkness one day and spoke to me and then took me on a 20 year journey in learning how to hear Him clearly… and then told me to start teaching people. I know… I know… to those who don’t believe in God or don’t believe that He speaks I sound like a lunatic! Believe me, I had to weigh that out before agreeing to get serious about teaching this! But now I’ve been able to speak about this topic… HE has opened doors and I’ve been able to teach beautiful Swaziland girls, congregations in South Africa, and even congregations here in the USA. This message has been developing and forming inside of me for years and now the time is right for it to come out. This is the year. This is the time. So one of the things I like to do in my personal life to learn to hear Him better is to test my ability to hear. I practice. For those of you wondering, I do NOT hear literal voices just like you don’t hear literal voices… but you have thoughts going through your head all of the time. Are you 100% certain those thoughts all originated with you? Does the Holy Spirit live within you? Did not Jesus say “My sheep hear my voice and they know me?” For a blog post on how demons can speak to you without you even knowing it, go here. Last Saturday, in a strange twist of events, I had the entire morning to myself. My kids were occupied at church and my husband went shooting with a friend. I suddenly found I could do whatever I wanted to. It was a rare occasion indeed! 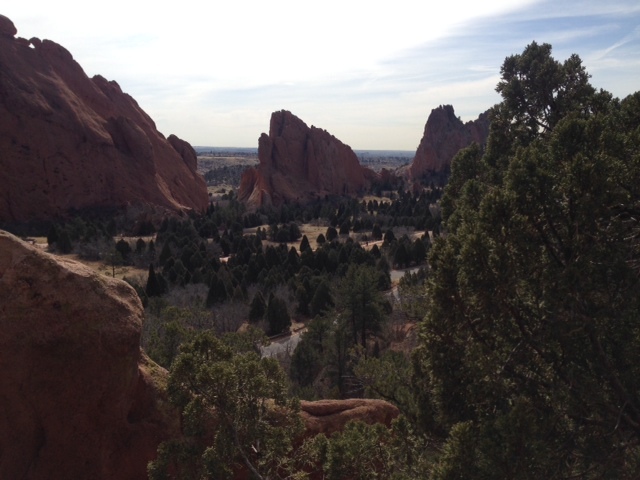 I grabbed my running shoes and headed to Garden of the Gods. I took off on Palmer Trail (took this shot on the run) and by the time I took a few detours back to my car I had gone 5 miles. This was exciting why? Because I never have time to run five miles. Ever. So, this would be the end of a somewhat boring-for-you story until I got into my car and started to drive away. I passed pull off #11 on the main road and saw this sign. I have never seen this sign before, but because of my visit to the giant footprint in South Africa, and my research on the other giant footprints around the world, I got really excited and made a few assumptions about what this was. I stopped at the Trading Post Gift Store and picked up a trail map. The map shows you where the giant footprints are, so I pulled off and parked. I made my way to where the footprints were supposed to be but couldn’t find them. In my book Snatchproof, The Art of Hearing God’s Voice, I have a chapter that talks about how important it is to practice hearing God’s voice. It has examples of ways to practice, and asking Him to help me find these footprints would be a great example of this kind of exercise. I prayed and asked God to help me find them. He’s used to me doing these kind of exercises, I think He likes it when we try to hear His voice better. John 10:27 says “My sheep hear my voice and they know Me.” This is my goal in life…to be able to hear Him clearly – and teach others to hear Him as well. My first thought was that I wasn’t hearing Him well that morning. I wasn’t talking smack back to Jesus, I was talking to myself because what He said didn’t make sense to me at the time. I thought I was hearing my own thoughts instead. I was frustrated that I hadn’t heard the Lord clearly. After about 20 minutes of searching I gave up and decided to go research it online. When I got home and looked it up I felt incredibly foolish. ‘The Giant Footprints’ is a rock formation that looks like footprints. They are not actual footprints. I feel like I should have known that, living here in Colorado and all. But apparently I didn’t. Dang it. 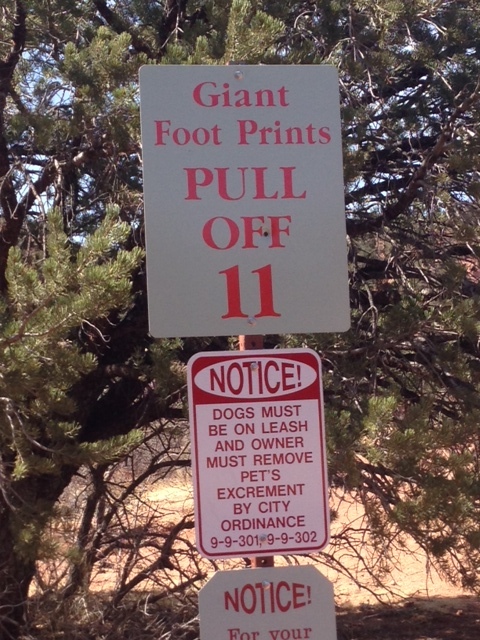 It would have been more exciting if it had been actual ‘giant’ footprints. But, it does mean that I heard His voice in that exercise. I had dismissed what He said. I had counted it as my own thought because it didn’t fit into what I was expecting to hear from Him. Dang it again. How many times do I miss His voice because I’m off base or clearly misunderstanding a situation. How many times do I miss Him because I’m expecting to hear (or wanting to hear) a different answer. This is an area that I’m trying to go forward in and get better at. I seem to recognize His voice more clearly when it fits what I’m expecting to hear. So it’s not that I didn’t hear Him… I did hear Him. It’s that I didn’t trust that it really was Him. It’s when His words contradict my expectations that I second guess Him. I’m learning Lord, I’m learning! The more I practice, the more sure I become of His voice speaking. That’s why practicing to hear Him is such a good thing! If you feel like you want to know how to hear His voice but have no idea where to start, get my book. It’s basic and will help you gain the courage to listen for the voice of the Lord in your life! It is a burning passion in my heart to show people HOW to hear Him! He’s speaking, and He loves you so much. I can’t wait for you to find out! My book just came out THIS WEEK so I’m really excited about it! If you’d like to order, I’m doing a presale where you will get an autographed copy sent to you. You can pre-order the book and/or donate by clicking on this button. It will allow you to put whatever amount in you want. Please consider that it will cost me $2.65-$3.00 to mail you the book once I get them and sign it. If you would consider a donation of $14 or more, postage will be covered and any extra will go to help me pay the translator to get the book in Spanish! Unless I order large amounts, I don’t get a large discount. If I want to get 50% from the retail price of the book I have to buy $5000 worth of books from the publisher. I’m not in a position to do that but we are doing what we can. Your purchase of the book direct from me helps me to pay the publisher bills and continue to get the book out. I greatly appreciate it! For those who don’t want an autographed book, you can order directly from the publisher HERE. For those who want to download it on KINDLE, CLICK HERE. Next Post How Do You Hear God? Hi Wendy! I just ordered your book! I love how you said, “How many times do I miss His voice because I’m off base or clearly misunderstanding a situation. How many times do I miss Him because I’m expecting to hear (or wanting to hear) a different answer.” because that’s exactly how I am! I look SO forward to reading your book and learning and practicing how to hear God speaking to me!